The mail to this web site, please copy the following address . Last update　&　What's new? I supplemented the lack of the instruction of "U-Boat type VII C" with "Instruction 02a". 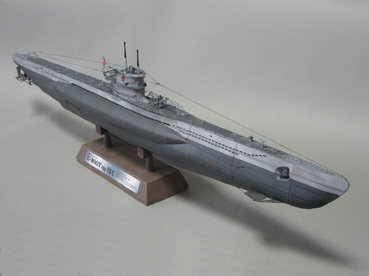 New free paper model "U-Boat type VII C" was uploaded in Leviathan section. There are some handicraft examples. The example of paper model "Old Imperial Japanese Navy　Kamikaze manned torpedo "KAITEN"" was uploaded in Leviathan section. The example of paper model "German Submerged Assault Vessel　NEGER" was uploaded in Leviathan section. At present, there are no new contents. I'm sorry. This banner was made by Mr.Niels. Thank you very much, Mr.Niels!! In fact,I received notice of transfer and I had to move to another place since '2006. I live in the town that is about 70km(43.5 miles) distance from my home now. However my children can't move there,because of the entrance examination to an upper school. Anyway,the problem is that we (my family) don't have only one set of computer. Therefore, I cannot use the Internet at the new living place. So it's difficult to update my web site often. But I'm going to make an effort to continue without stopping it. The new free paper model is "1/100 U-Boat type VII C". It was a very long way.